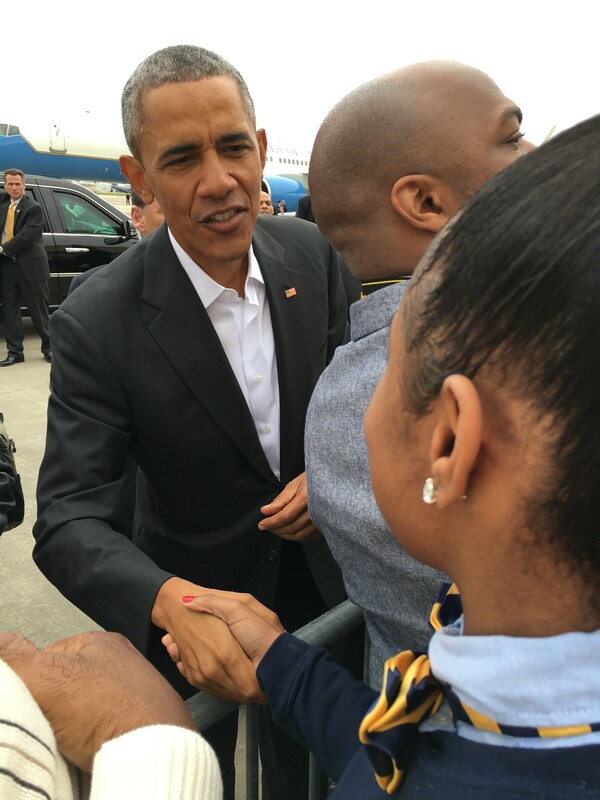 This post was written by Democracy Prep Baton Rouge sixth-grader, Oriana Shalece C.
January 14, 2016 is now the most memorable day of my life. Why? Because on that day I met and shook the hand of President Barack Obama, one of my heroes. How did it happen? Well, it was no ordinary experience. My principal and I got special tickets to observe Air Force One leave from the Baton Rouge airport. When we arrived, we had to wait in line and get searched by the Secret Service. One of the agents went into his truck and got this big dog. I was scared! He told me that if I pet the dog, he’d give me a gift. I gathered my courage and touched it. The agent gave me a Secret Service pin. As the President got closer and closer to us, I grew more excited and started to realize how life-changing a moment this was for me. Seeing President Obama made me think about all the possibilities out there for my peers and me, if we believe in ourselves and put in the kind of hard work that allows for success. When he finally reached me, I put out my hand. He shook it and said, “How are you, young lady?” I was so thrilled I’m not even sure that I responded! That moment was the best one of my life so far. It made me think that I could do anything in this world. Attending Democracy Prep has also made me think I can change the world. One of the ways I’ve learned people can change the world is through civic engagement and voting. In fact, I was chosen to meet the President because when we were out telling people why they should vote (for our GOTV campaign last November), I conveyed the values of our school better than anyone else in the College Class of 2026. Don’t worry, I didn’t tell them who to vote for because that is their choice and this is a free country, only that they do have a voice and they should express it. Remember that Secret Service pin I told you about? Well, every day that I put it on for school I think of that day and how proud my mom, my two sisters, and my family and friends were when I had the honor of meeting the President. I’m hoping for many more memorable moments as a scholar at Democracy Prep, but this will be hard to top! Oriana Shalece C. is a sixth-grader at Democracy Prep Baton Rouge.